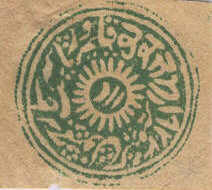 Text: From The Stamps of Jammu and Kashmir by D.P. Masson, pp 25-29. Three stamps have imposed upon advanced collectors for about thirty years, and I am very pleased to be the means of bringing them to justice in the end. The first two are the ½a and 4a of the so-called “Die I“ circular type. I have carefully examined both a “used” and an unused copy of ½a stamp, and I do not hesitate to say that both are forgeries. I have not seen a copy of the 4a stamp, but the illustration in Stanley Gibbons’ catalogue shows it to be a near relative of the ½a one. I place on the left [below] the Die I and on the right a clear impression from the genuine die of 1866, known as Die II [Copyist’s note: Of course the latter is no longer known as Die II with the demise of Die I as a legitimate issue.] On examination the first thing that strikes one is that the characters in either case occupy exactly similar positions on the dies. 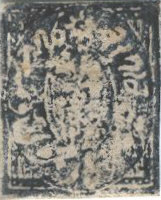 This fact is in itself suspicious, because, if two successive sets of dies were cut, as the supporters of this stamp assert, what necessity was there for a slavish following in the second set of the exact position, and (as far as possible) the exact shape of each character on the previous die? This to my mind is the first proof that Die I is simply a forgery, cut to represent Die II. The next striking difference between the dies is the extreme roughness of the cutting of Die I as compared with Die II. On well-printed copies of the latter, all the finer lines and curves of the Persian characters are reproduced with fair clearness, while in the former there are neither fine lines nor curves. The Persian on Die I is a rude imitation, and could never have been cut by a literate Indian. It is in fact a series of ‘shots’ at reproducing the characters. To show how wide of the mark these shots are, I need only refer to the characters representing the word ‘Kashmir’ which lie between the date (1923) and the central sun, on the die, occupying the space between half past three and six o’clock on the dial. It is utterly impossible that any person who knew what he was doing could have converted these characters into the Noah’s ark toy-animals shown in Die I, the vowel dots being converted into legs. The Dogra letters (occupying the position between 1 and 3 o’clock) being boldly cut on the original, are naturally reproduced more faithfully. 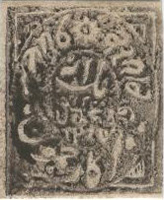 The roughness of the engraving is admitted by the supporters of the stamps, and is even used as a proof of their genuineness and rarity; their theory is that, being so roughly cut, the dies were immediately superseded by superiod ones. I venture to assert that it is simply impossible such dies could for one hour have been used, for Government or other purposes, in a country where at the time seal-cutting had attained the excellence of a fine art. The dies appear to have been cut in Europe, from poor or heavily obliterated copies of Die II or from photographs. The photograph theory might account for the slight difference in size between the genuine and forged dies. At the time there was a considerable correspondence between Srinagar and Paris, in connection with shawl trade, and I feel confident that Die I was made in France. The obliteration on the stamp which I have seen is, like the stamp itself, a forgery. 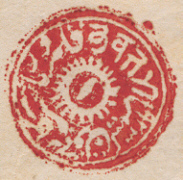 It is meant to represent the brick-red obliteration of the Srinagar Post Office; but, whereas all genuine obliterations are impressions or dabs from the well-known small circular seal, in this case the colour is smudged lightly over the greater part of the face of the stamp. The number of colours in which this stamp is printed is its absolute condemnation. It is clearly of the Kashmir type, not of the Jammu one. 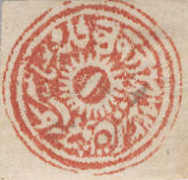 If it were a genuine die, therefore, its only place in the philatelic history of its province would have been as a companion to the rare ½a single die of 1866. 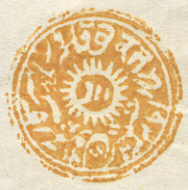 Like that ½a stamp it would have been printed only in black, justifying M. Moens; it would have been superseded by the composite plate of twenty ½a and five 1a stamps [text corrected, ed.] in 1867, and that would have been the end of it. Let us grant a little more, and allow that the 1a die had survived the ½a one, and had been printed from, side by side with the composite plate, and in the same colours, during the second experimental and the final standard printings from the latter; this would account for the blue, the orange-red and perhaps the brown colours. 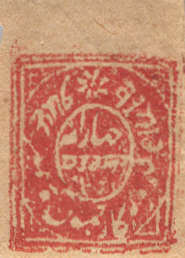 But how, by any possibility, could impressions from a Kashmir 1a die be printed in vermilion and carmine-red, seeing that red and its shades were reserved for the Jammu stampsexcept in the one case of the 8a Kashmir stamp already mentioned. 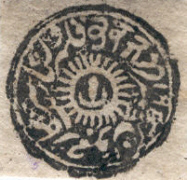 (I am aware that some catalogues chronicle a vermilion stamp from the standard Kashmir Province plate, but this cannot be correct. A fiery orange-red is the nearest approach to this colour possible). Suppose on the other hand, that the die is a forgery; the forger, not knowing that there were well-recognized colours for each province, would proceed to print indiscriminately in all the known colours of both provinces; but he would print sparingly, for he was a very astute person, and I should not be surprised to hear he knew a lot about Die I. But was the die after all genuine, and was M. Moens right in listing black as the only genuine colour? then whence the other colours? Did the die get into wrong hands in Kashmir (in the case of such a supposition being correct, it could have happened only in Kashmir) and did the holder proceed to print off in all the known colours? That is improbable, if not impossible, because the printings would have been on a liberal scale, and the stamp would no longer have remained rare. 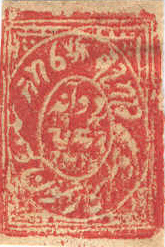 Nor was there an official re-issue in many colours, as in the case of rectangular and circulars in 1875-76, because (1) copies would have been postally used, and the stamp would be better known, and (2) there would certainly be no mixing of the colours of both provincesthat depth of latter-day Kashmir Philatelic depravity was not reached till the period of the fancy reprints of obsolete stamps, in 1884 or later. Finally, granting that all the impossibilities mentioned in the last paragraph were possible, then the stamps are the veriest reprints, even the blacksfor we may be certain they also would have been reprintedand the prices should be reduced from pounds to pence. But the impossibilities are not possible. 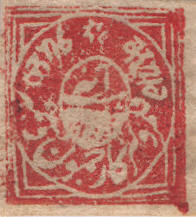 Text: From The Stamps of Jammu and Kashmir by D.P. Masson, pp 30-35. I have tried, but in vain, to learn the history of this gigantic swindlethe duplication of all, or nearly all, the circular and old rectangular dies, and the sale to the unsuspecting dealers, of thousands of impressions from these, as genuine stamps of Kashmir. Captain Godfrey, the Assistant Resident in Kashmir, has made careful enquiries, but the old postal officials can give him no information. That the swindle was known to some high postal official there can be no doubt, for the stamps were openly sold to collectors at the State Post Offices up to the time when the Postal administration was taken over by the British Government in 1894. Indeed they were offered for sale, in all innocence, by the British Accountant-General, and by the Agent subsequently appointed by the State, until I questioned their genuineness in the columns of the Philatelic Journal of India in 1898. 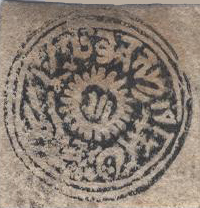 It seems that collectors at home had suspicions, and fought shy of these stampsand indeed of all Kashmir stamps in consequencebut in India visitors to Kashmir had perfect faith in the circumstance that they were buying from a State department. It has been suggested that some high State Postal official was the culprit; that he sold large quantities of reprints from the genuine dies, without accounting to the State for the proceeds, and that he replaced them in his Treasury by impressions from forged dies cut for the purpose. This is not impossible, because all departments not directly under British administration were undoubtedly corrupt. [Note added in footnote: Captain Godfrey accepts this solution, and says he remembers seeing the sheets of these stamps sandwiched with impressions from the genuine dies, when taking over the State remainders.] One part of the suggestion is any way correctthat the missing dies are contemporaries of the reprints, if they were not their juniors, for they are never found postally used. [Note added in footnote: Major Evans informs me they were not known in Europe until 1890, in which year he described them.] It will be enough for the philatelists to know that these sxtamps should be left severely alone, and fortunately there are discrepancies in the dies that render detection possible. For their guidance I will point out the principal discrepancies that I have noticed. I will place side by side clear impressions from the genuine dies, and impressions from the “missing dies,” for each of the three denominations, those on the left being the latter. I will follow the course suggested in §3, by placing the first Persian letter near the position of the 12 o’clock on a watch dial. 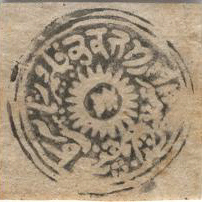 Taking first the genuine ½a stamp, I will ask you (the enquiring collector) to examine the figure-3-like first Dogra letter. It stands out boldly by itself, in a perfectly comfortable position, [hovering above] a single ray of the central sun, and is in no way dependent on its Persian neighbour to the left. In the other type this letter is in imminent danger of falling backwards, though resting above two rays, and it appears to have crooked its lower limb well into the Persian neighbour to prevent the catastrophe. The shape of the letter, and the position and its inclination in the circle, at once strike the eye as differing very decidedly in each type. Then the last letter of the five Dogra characters in the genuine type is slightly curved, and is placed at a slight angle to the figure 1 (of 1923 in Vernacular figures) immediately following; in the other type it is quite straight, and is not placed at an angle with the following figure 1, but in the same plane. Coming further down the dial, to the position of half-past 5 o’clock, two small lines will be found on the genuine type, which are in direction with two rays from the central sun; in the other type these two lines are drawn at a wide angle to the direction of these rays. Then take the right hand one of the three strokes in the centre of the sun: if you prolong this line downwards, it will pass through an inverted comma-shaped letter at 7 o’clock, in the genuine type; do the same in the other type and the line will leave the comma well to the left, and will form an arrow to a bow-shaped letter at 6-15 o’clock. Again the forgery is on the left and the authentic design, supplied by a reprint, is on the right. 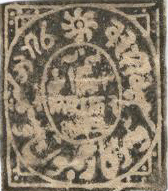 In the 1a stamps the striking differences are that the shape of the second Dogra letter in the forgery is bent-backed and not straight as in the original. In the genuine design, the right horn of the semi-circle, in which the denomination stroke is placed, is crooked inwards, so as almost to touch the stroke, while in the forgery there is no crook. 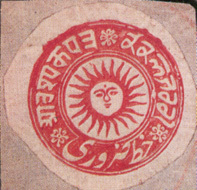 Were the stroke of the genuine type prolonged upwards, it would pass out between the first and second Dogra letters, that of the other would pass right through the left side of the first letter; and the two outer circles of the forgery are so close as to print an almost continuous single ring. Take next the 4a stamp [above] and two differences are easily detectedthe second Dogra character, on the genuine type on the right is decidedly bent in the back (reversing the situation of the 1a) and the central stroke if prolonged upwards would come between it and the first letter; in the forgery the same letter is perfectly straight-backed, and the stroke if prolonged would run up this back. In the genuine type [the middle of the three images] the Dogra letters have all their ends sharp, in the other they are blunt, and the third letter especially is dumpy. The 2a Kashmir. The fatal mistake is made in the forged stamp of leaving a margin on the four sides, which is of course impossible, seeing that the genuine 2a stamps were printed in strips of five, each touching the other; the star at the top is small and badly formed; the dots in the spandrels are large and coarse, and there are only about ten in each corner, between the lines, as compared with 13 to 15 in the genuine stamp. The first letter of the Dogra is straight-backed instead of bent-backed. Major Evans informs me that he generally finds these in fivesclose together, to imitate the blocks of five in the genuine stamp. The 4a Kashmir. The dots in the spandrels are entirely omitted in the forgery. The third letter of the date, at foot of the oval, resembles our 3, while in the genuine stamp it resembles our 2. There is an extra outline, also, to this and the 8a forgery. The 8a Kashmir. 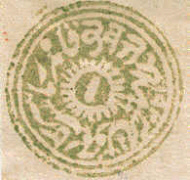 In the forgery the dots in the spandrels are again omitted; the star is much smaller, and the two lower lines in the oval (containing the denomination and date in Dogri) are badly cut and illegible. The ½a Jammu. 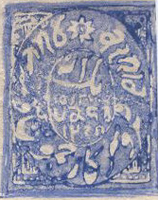 In the forgery (1) the mistake is again made of having a border all round, which I have shown is impossible in impressions from the genuine plate; (2) the start at the top is fuller, and the ends of the rays are more blunt; (3) the first Dogra letter is straight-backed instead of bent-backed with the third and fourth joined, forming a rough ‘m’; (4) the third figure [in the date] is like a 3 instead of a 2. What makes this forgery the more dangerous is that I have seen it “used,” being obliterated apparently with the genuine Jammu square black seal. All three missing die circular stamps, and the three Kashmir Province rectangular ones, formed part of the State stocks that were on hand when the Postal Administration was taken over by the British Government; the Jammu Province imitations were, I believe, from a private source, but I include them here on the authority of Major Evans, who received some specimens along with the other missing die stamps and from the same source. 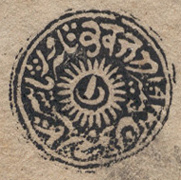 Text: From The Stamps of Jammu and Kashmir by D.P. Masson, p 36.